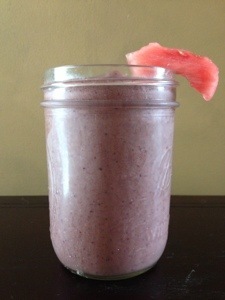 Berry Watermelon Green Smoothie – .rebel grrrl living. 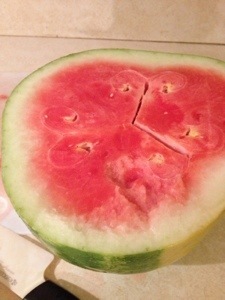 As I mentioned last week, I’ve been eating a lot of watermelon. Is it not the most perfect summer fruit?! So sweet, so refreshing, so hydrating! Smoothie-lover that I am, I decided to try adding some of this juicy fruit into my blender. The results were wonderful. 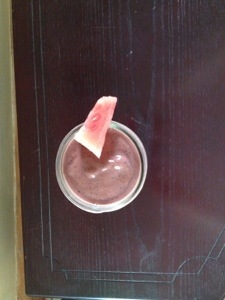 The melon provided an almost creamy quality to the smoothie, and of course, added a delightful flavor. I highly recommend giving this a try! Blend all the ingredients together in a high-speed blender. Pour and enjoy! Have you ever added watermelon to a smoothie? Thanks! I don’t usually have a problem with food combining, but I know some people do, so thanks for the comment! I made that melon smoothie with cantaloupe not that long ago, but love that you added greens and extra berries to this smoothie. I would shlurp this. Did you use protein powder in yrs? I saw yr cantaloupe smoothie. It looked bomb! I did use protein powder, yes. I’ve become a Sun Warrior convert! This is so funny – I just posted yesterday about a smoothie that is very similar to this :D Great minds think alike, clearly! NOM- I need to try watermelon in a smoothie, seems like the most perfect addition, especially in the summer. Bonus since it’s so hydrating too! Pingback: Ginger, Kale, & Cantaloupe Smoothie | .rebel grrrl living.